How to Handle Common Electrical Issues at Home | Hi-Lite Electric Inc. The electrical system in our homes is a complicated network of wiring, devices, and safety features. In fact, it is common for even an average sized house to have more than one mile of wiring within the walls. With so many possible points of failure, it’s bound to happen to come across minor issues in your home. If you find yourself dealing with electrical problems at your home, chances are it is a minor issue that you can fix yourself. 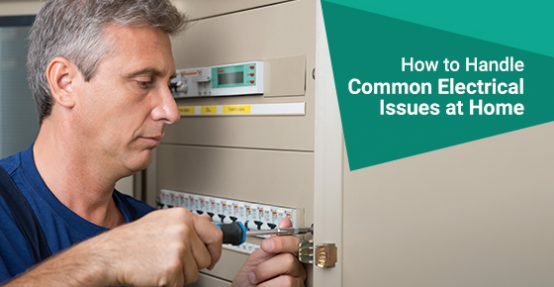 More complicated troubleshooting will naturally require a consultation with a licensed electrician, but understanding the cause behind some common problems with your home electricals system will set you in the right direction. If you’ve found that some outlets no longer work when you try to use the vacuum or a lamp, or the lights in the hallway won’t turn on, there may be a couple reasons for this. First, take a look around and find if there are other outlets or switches that don’t appear to be working. The scope of the issue will narrow down the culprit. If a switch does not turn on the lights but everything else seems to be working, it may just be the lightbulbs that need to be replaced. If this does not work or the rest of the room is without power as well, then it is more likely to be an issue in your circuit panel which is discussed in the next section. This is a common cause for losing power in a room or section of your home. Circuit breakers can trip for a number of reasons depending on the age of the panel and circuit breaker. Older models will only trip if their amperage rating is exceeded, which is typically 15 or 20 amps for general circuits and up to 50 amps for large appliances. Newer circuit breakers will also trip if they detect any arcing electricity, such as unplugging a device while it’s running. Open the outer cover of your electrical panel to inspect the individual circuit breakers. Typically a circuit breaker that is active will point towards the center of the panel. If a breaker has tripped, it will have its handle sticking straight out, in the middle position. You can reset it by turning the handle to the off position, away from the center of the panel, and then back on. With the breaker back on, check to see if the affected areas of your home are working again. In newer homes, outlets in the kitchen and bathroom will have GFCI – Ground Fault Current Interruption – protection; they are designed to protect against electrical shock if any appliances get wet by instantly cutting power to the outlets. You can see if the outlets are GFCI protected by looking for an outlet in the kitchen or bathroom with a ‘test’ and ‘reset’ button and sometimes an indicator light. If it’s the GFCI outlet that has tripped, press the reset button to restore power. If your home has two bathrooms, check each bathroom because one GFCI receptacle may provide protection for both. If the outlets don’t have a reset button or they lack the feature, check the electrical panel for tripped breakers. If you’ve seen light bulbs in your home becoming brighter or dimmer than normal, one thing you can try is new bulbs where you’re having the issue. If replacing the bulb doesn’t help, it may need troubleshooting by an electrician. This issue is caused when the voltage going to a light bulb is too high or too low, which can, in turn, be caused by a loose neutral wire in the switch box or inside the panel. In either event, it’s not recommended to handle this yourself unless you’re trained to do so or turn the power off first. Typically, appliances such as your electric stove and dryer run on a double-pole circuit breaker. This lets them run at 240 volts instead of 120 volts to increase their efficiency while drawing less wattage. A common issue for these appliances is when they start to operate much less efficiently than normal, whether it’s an oven that doesn’t cook hot enough or a dryer that takes much longer to complete a load. This is usually caused by one of two things: either one of the wires on the circuit breaker has come loose, or one of the two primary feed wires coming into your panel isn’t working normally which may also affect one half of the electric panel. In either event, this involves going hands-on with potentially live wires so you’ll want to consult with a licensed electrician for this. First, listen to the sound that the smoke detector is making. If the battery on them is getting low, they will chirp every few minutes as an indicator. However, if the smoke detectors are going into full alarm mode, this may be due to a voltage issue. This affects smoke detectors that operate on 120 volts more than 12 or 24 volts. If the voltage going to the smoke detectors spikes or drops, it may set them off inadvertently. You can sometimes fix this by replacing the smoke detectors with newer models, but if the problem persists then an electrician may need to troubleshoot the cause. Before attempting to tackle any electrical problems with your home electricals system, always remember that your personal safety comes first. Electricity can be dangerous or lethal even at a low voltage, so be sure that you have turned off the power before starting any work. If you aren’t comfortable with any of these steps, then it is best if you call a licensed electrician. This way you can be sure that you stay safe and the problems are fixed by a qualified professional.